Well, the semester has begun and though I wish I was creating blog content all the live long day, I’ve been back to teaching and guiding students through their first few weeks of gender & women’s studies classes. For the first time in a long time, I’m teaching some intro-level classes, which are my absolute favorite. Observing students as their minds are being blown is just the very best feeling as a teacher. These are the perks! Before things really got underway this semester, though, I celebrated my birthday last week with a friend whose big day is just a day before mine. Surrounded by friends and loved ones, we drank champagne and ate an amazing Italian-inspired meal, al fresco, in our beautifully decorated side yard. It was quite a time! 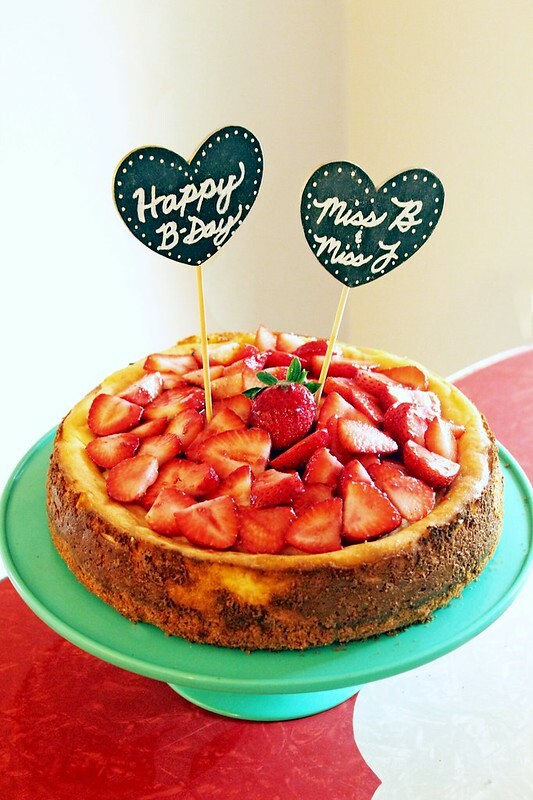 For dessert, I made us a giant cheesecake, covered in the season’s sweetest strawberries, and used these easy DIY cake toppers I had made the week before to make it extra special. If you follow my Instagram feed or checked out the highlights from Charlotte & Katie’s wedding feature, these may look familiar to you. 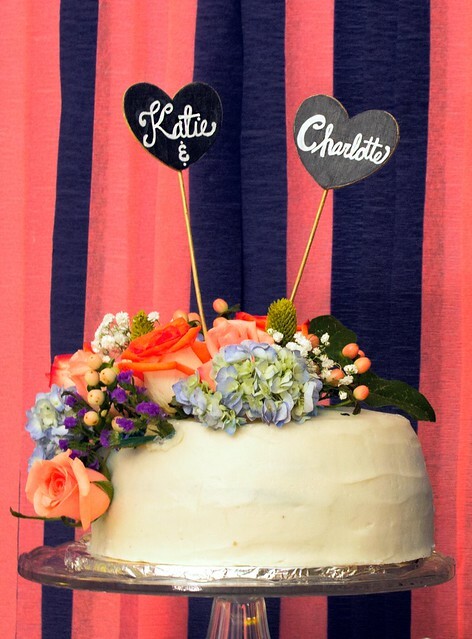 I made Charlotte & Katie a pair for their wedding cake back in July and because they were just so easy (and almost criminally inexpensive), I followed up with a set for myself. What’s wonderful about them is that they’re reusable – the white paint that spells out your message of “Happy Birthday!”, or what have you, is written on a chalkboard paint background with a chalk marker! With a damp cloth, the slate is wiped clean and they’re ready to go for your next happy, cake-included, occasion. You’re limited here really only in terms of what shapes of wood you can find. While I’ve come across other shapes and sizes at Joann’s, these hearts are my favorite and are most applicable to a variety of holidays and events. Chalkboard paint, though, is available in so many different colors now and what you use as an accent color for the backs, edges, and skewers is entirely up to you. Now that I’m thinking of it, I wish I had tracked down a hot pink chalkboard paint because, paired with the metallic gold accent, it would have been a femme birthday dream come true! This is an easy craft that you can pull together in about an hour total, that costs only a few dollars, and will add a really personal touch to any future party. Arrange them on cakes, pies, cupcakes, and even stuck in the middle of a mound of cookies. They’re a sweet addition to any dessert and something you, or your loved one, can hang onto as a memory afterward or re-use in the future. 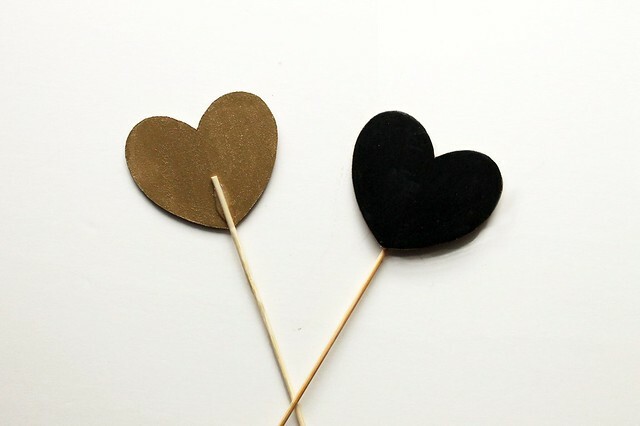 Two wooden cut outs in any shape; I used hearts from Joann Fabrics, which were under $1 each! On a flat surface lined with newspaper, paint the backs and edges of your shapes with your accent color of choice; I used the foam brush for the back and the thin-tipped brush for the edges. If you get a slight bit on the front, just wipe it off as best you can, but don’t fret – the chalkboard paint will cover all. After the accent color has mostly dried – about 10 minutes – apply a second coat to backs and edges. When the second coat dries either move on to the following step or add a third coat if needed. Using the thin-tipped brush follow your shape and paint a perimeter on the front of the piece with the chalkboard paint so that you create a margin and don’t risk painting over the edge that you just painted with your accent color. 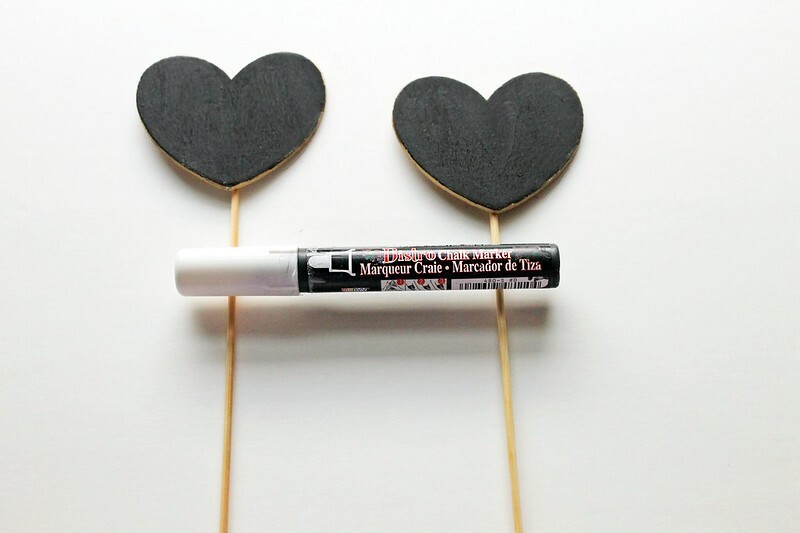 Using the wider foam brush, fill in the shape with a coat of chalkboard paint and allow to dry. Follow this step for the front of the shape for at least three coats in order to get a truly opaque surface. Allow to dry completely. If need be, touch up the edge with your accent color. 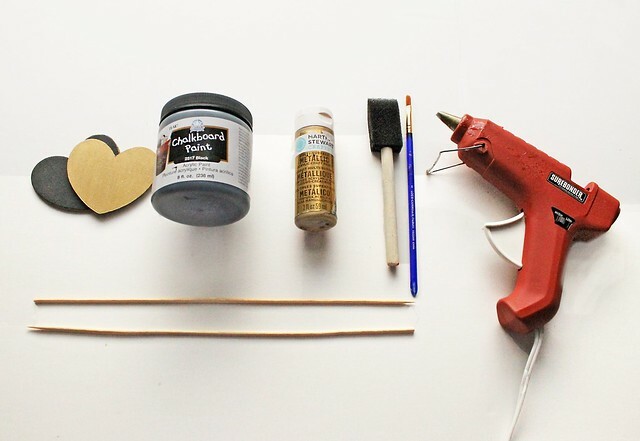 When your shapes are completely painted and dried, heat your glue gun and ready your two wooden skewers. If you choose to paint the skewers in your accent color, painting them when you paint the shapes is the best plan, as painting them once they’re glued to the shapes is a bit awkward. Flip your shapes over so that the back side is facing up. Apply a small, 1/2″ or so line of hot glue to the back of the shape and press the top, non-pointed, side of the skewer into the glue. If the glue is not enough to encase the top of the skewer, apply a bit more glue over top so that it is covered. Do the same to the other shape & skewer and allow to dry completely. Hot glue is usually clear, so depending on your preference, you can either leave as is or, if you’d like, once the glue is hardened and cooled, you can use your accent color to paint over the glue and make it blend a bit more seamlessly. This step is optional. Once the skewers are dried, the cake toppers are ready for use. Use a chalk marker for easy, seamless writing (or regular chalk if preferred) and spell out your message of celebration. Chalk markers can be easily removed with a damp cloth (avoid paper towel, as it catches on the paint and the wood). Allow surface to dry before re-printing.